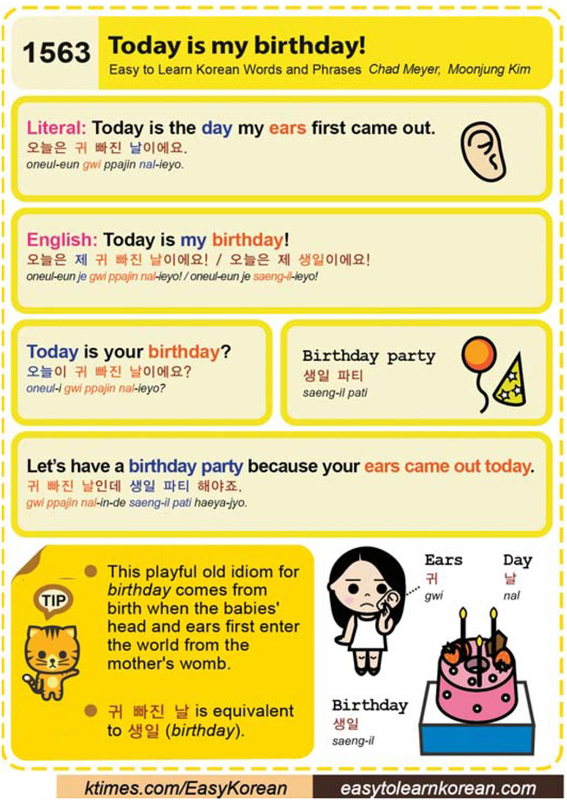 Easy to Learn Korean 1563 – Today is my birthday. Posted in Series	| Tagged Birthday, birthday party, day, ears, expression, idiom, Let’s have a birthday party because your ears came out today., today is my birthday, Today is the day my ears first came out., Today is your birthday?, 귀, 귀 빠진 날, 귀 빠진 날인데 생일 파티 해야죠., 날, 생일, 생일 파티, 오늘은 귀 빠진 날이에요., 오늘은 제 귀 빠진 날이에요! / 오늘은 제 생일이에요!, 오늘이 귀 빠진 날이에요? 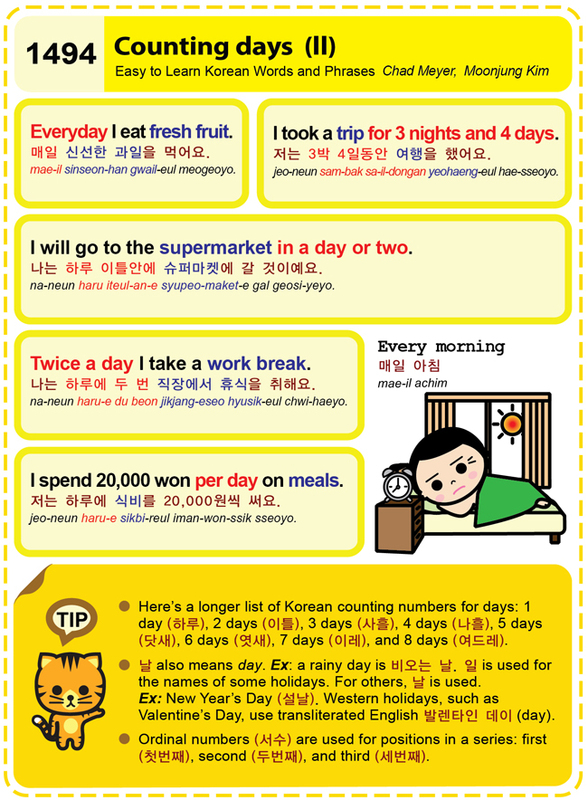 Easy to Learn Korean 1494 – Counting days (part two). 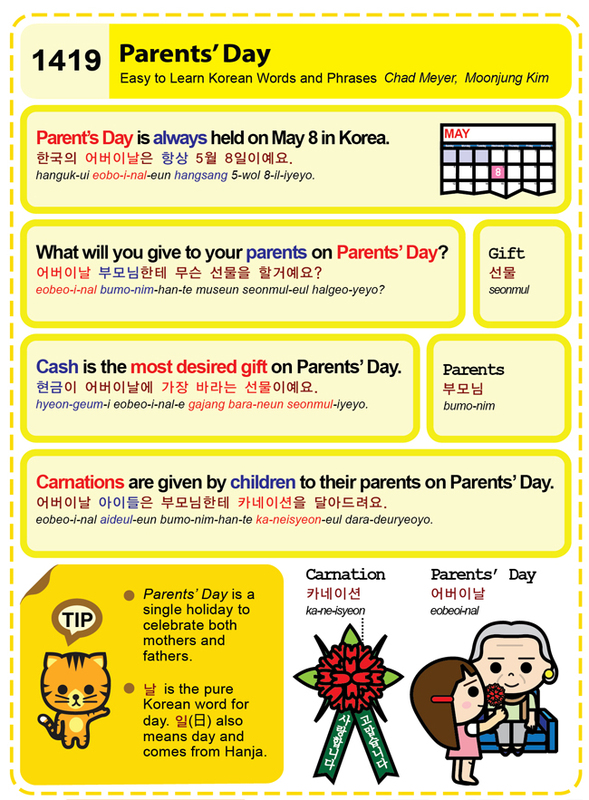 Easy to Learn Korean 1419 – Parents’ Day. Posted in Series	| Tagged carnation, Carnations are given by children to their parents on Parents’ Day., Cash is the most desired gift on Parents’ Day., eobeoi-nal, gift, holiday, Parent's Day, parents, Parent’s Day is always held on May 8 in Korea., What will you give to your parents on Parents’ Day?, 日, 날, 부모님, 선물, 어버이날, 어버이날 부모님한테 무슨 선물을 할거예요?, 일, 카네이션, 한국의 어버이날은 항상 5월 8일이예요., 현금이 어버이날에 가장 바라는 선물이예요. Easy to Learn Korean 990 – First rainfall of the year. Posted in Series	| Tagged 19일경 이에요., February, first rainfall, rain, second solar term, snow, snow to rain, spring, spring rain, this day, usu, weather, 雨水, 날, 눈, 봄비가 내리네요., 봄이 이날 이후로 곧 올거에요., 비, 우수, 우수는 2월 18, 우수는 눈이 비가 되어 내리는 때를 의미해요.